A large number of people throng the tapered streets of the market; cubicle-sized stalls are cluttered with colourful and chaotic displays of clothes, shoes, sneakers, lingerie amongst other fairly used products of different variations. Many customers have to walk the breadth and length of different plazas while jostling for space in the cut-and-thrust of the market, searching for the best bargain. The Yaba market is a maze with different routes leading in and out, a crop of itinerant traders is littered across these strategic points trying to woo people. However, this strategy of upselling to potential customers has over the past few decades denigrated to an on a slew of whistling, stalking, constant groping, sexual slurs, physical assault, emotional abuse amongst other derogatory slangs that are directed towards women. The ‘Market March’ initiative was created by Damilola Marcus, a Brand identity designer who was spurred by the drive to curb normalized bullying and harassment of women in the market. Hitherto women have lamented bitterly about market harassment but there has been no respite regarding the issue. “The vision of Market March is a world where women don’t have to over think their outfits and psychologically prepare their minds just to take a trip to the market. A world where this normalised menace becomes an absurdity” said Damilola. “Most of the time, if you don’t touch these ladies many of them will not buy,” said Osita Kalu, a trader who sells lingerie at Yaba Market. It is rather unfortunate that women, on a daily basis, are prone and subjected to myriads of sexual harassment by men thereby turning visits to the market to either a physical, mental and emotional struggle. “I broke down in tears the first time I was in Yaba to buy clothes; I have never been harassed in such manner. I felt violated,” said Chioma Fidelis. The market setting in Nigeria is open and mainly traditional, yet highly vivacious and exasperating. Open markets seem to be highly favoured by traders and customers, virtually anything can be found in the market, ranging from foodstuff, textile and clothing, spare parts, groceries, electronics, amongst others. It is easier, cheaper and undeniably more ubiquitous, doting everywhere possible in the country. Urban public space is an area that is generally open and accessible to people. Markets, beaches, parks, roads, amongst other public infrastructures, are often considered as public spaces. It is believed that Nigeria’s public space is a contested landscape with varying access which is dependent on factors such as gender, class, religion and ethnicity. According to the founder of Market March, the marches are the heartbeat of the movement and they restore the power back to women who have been harassed and bullied all this while, when you come out to march, you come out to take a stand against something that harms you. An online petition for stronger enforcement of the law has already garnered 23,000 signatories. Organisers are planning to have similar protests in other markets across Nigeria. 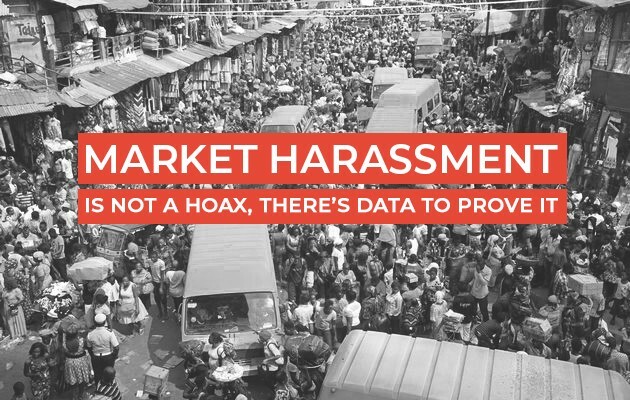 A poll survey conducted by The Guardian to assess the extent of market harassment nationwide reveals that 76.2% of women have experienced market harassment. The two major age demographic with the highest experience of harassment in the market (21–25) and (31–35) with 26.5% and 21.7% respectively. 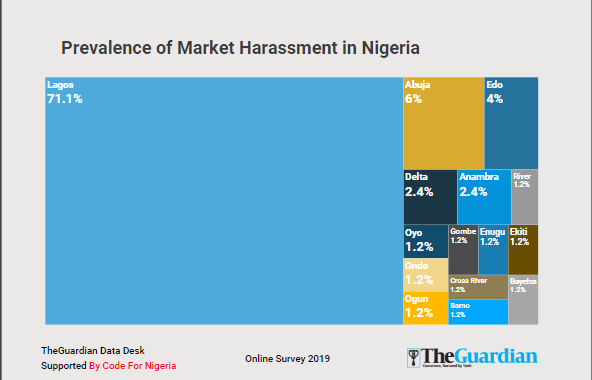 Lagos reported with the highest rate of market harassment experienced in the country with 71.1%. Some of the major markets in Lagos with a high prevalence of market harassment — Yaba/Tejuosho, Balogun, Idumota, Computer Village and Oshodi. Meanwhile Enugu, Onitsha, Benin, Abuja ranked among the states where it is largely experienced. Physical and Verbal abuse ranked among the major types of harassment experienced by women with a frequency of 69.8%. The survey revealed that these harassment have been experienced more than 5 times and mostly in the afternoon. 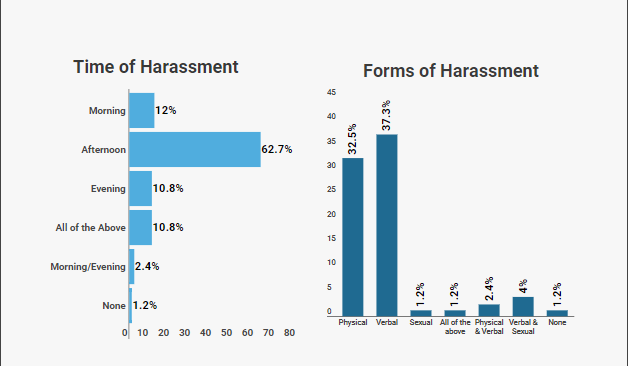 The most common forms of harassment are sexual remarks about look, poking, whistling amongst others. The survey revealed that 85.5% of the respondents believe that market harassment continues to persist because there is no strong opposition against it and severe penalty for men that engage in it. 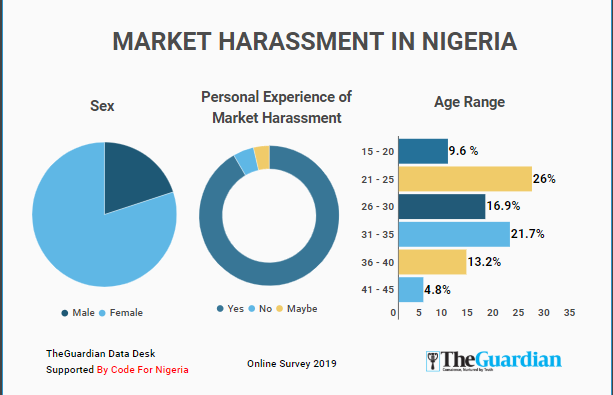 To end market harassment in Nigeria, most of the respondents opined that strong laws should promulgated to punish culprits and also the negative perception of men towards women ought to be changed. Originally published at guardian.ng on February 28, 2019.